Though constructed well before the Common Era, Petra remained under the radar of the West until the 19th Century. Ad Deir, one of the finest examples of old Nabataean architecture in Petra. In the mountains of Jordan, south of the Dead Sea, is the magnificent ancient city of Petra, carved out of the surrounding sandstone, with their pink, white, and red hues. This ancient city offers many unique sights, such as ancient domiciles, tombs, and temples, most hewed out of sandstone as well. The first-time visitor should not miss the chance to check out the imposing 45-meter-high Greek temple facade at the Al Khazneh temple site. The best time to explore Petra is during Spring and Fall, when temperatures are in a pleasant range, between 18 and 25 degrees Celsius (64 and 77 degrees Fahrenheit). Sunrise and sunset are the best hours to be in Petra, as this is when the sun most vibrantly lights up the sandstone colors of the temples. This destination is a must for any traveler who loves extraordinary places to visit. Everyone who has explored this magnificent place has been awestruck by its unique architecture. To get there, the average tourist flies to Amman, Jordan. From Amman, the usual options are then either a four-hour trip to Petra by car, or cheaper, often longer, bus ride. But if you are coming from Aqaba airport, you can get to Petra in only an hour and a half by car. Visitors shouldn’t forget to purchase entrance tickets from the visitor's center in the town of Wadi Musa, about 2 kilometers from the site itself, and children under 15 are able to enter the area for free. Visitors can find hotels, camping facilities, and restaurants in the area as well. Tourists can also find restaurants offering them the opportunity to dine on exquisite local fare on the site. 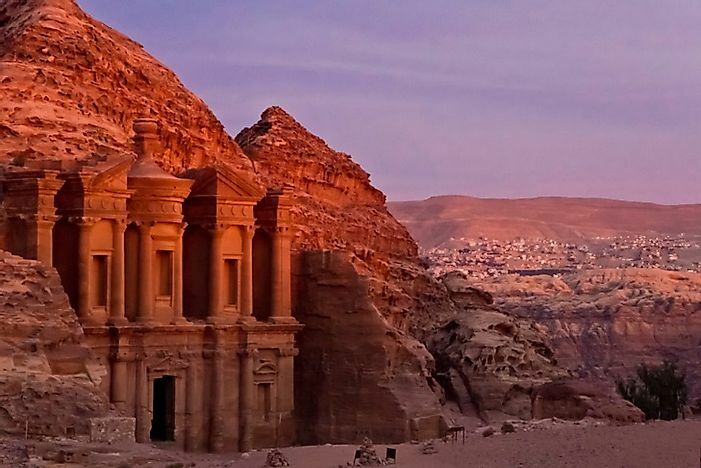 Jordan is one of the safest countries to visit in the Middle East today, and Petra is prominently featured in the New World Wonders list. The movie Indiana Jones and the Last Crusade also honored Petra, by showcasing one its historic temples in several scenes. For the explorers-at-heart who come to town, there are temples, monasteries, and tombs to explore. If that is not enough for the archaeological history buffs, two museums are also to be found within the immediate area. A shopaholic will not miss out either, as they will find incredible bargains on local goods among the Bedouin merchants as well. Even Aaron, the brother of Moses, has a shrine here, dedicated to him by a Sultan. Petra is full of wonders, and has been officially designated by UNESCO as a World Heritage Site. The ancient Nabataeans gained so much wealth from their caravan-based trading practices that they had to build a fortified city to protect it. This meant a city hidden in the desert that they could defend, and where it would also easily become a crossroads for their caravan merchants. The desert landscape is dotted with sand dunes, canyons, and water canals. Today, the site itself is populated with several kinds of birds, while along the outlying desert a variety of indigenous plants can be found. The Bedouin tribes people have replaced the Nabataean merchants there today. Petra is a safe destination in comparison to many other cities in the region, but tourists should know about occasional flash floods that can occur, especially in the canyons, after a heavy rain. There's also the threats coming from some local tribal people, who may scam tourists for money. Remaining cognizant and aware of these existing threats will help tourists keep themselves away from these dangers. Conversely, Petra’s integrity is threatened by many modern conveniences, such as cars and the influx of tourists themselves, as pollution can rapidly degrade the ancient construction marvels. People defacing the temples and other structures on historical sites is also another real problem. Looting and conflict are specifically a real and present danger to them, but to a lesser degree than seen in the 1990s. The decline in malicious acts can be partly attributed to the Petra National Trust, which has organized a risk management team to help keep such threats from destroying the city’s heritage.